It progressed when at least two scientist / bloggers ( here, and here) (not bloggers! the horrror! how uncivil!) gave public "journal club" presentations on blogs (envision dripping slime). It continued with the science journalists lamenting about having swallowed the hype. And it seemingly ended with another scientist / blogger's post that seemed to equate discussions of scientific technique in the public eye with airing a family's dirty laundry. One doesn't discuss this this in public, you know. It just isn't done. It isn't civil. Coupled to the arsenic debate is our very own tribal mythology of scientists who turned out to be right despite overwhelming skepticism (Peter Mitchell and the chemiosmotic hypothesis, Stanley Pruisner and prions, Ken Stuart and RNA editing, to name a few). Even the New York Times had to jump in and join the fun. I wondered if it wouldn't be fun to "put my experiment where my" blog is and see what sorts of arsenic-based treasures I could find, without of course, ever leaving my computer. My question was this: What arsenic-containing structures have already been shown to exist? Without further ado, here are some lovely structures that I found that that do contain arsenic. Figure 1. Arsenic and DNA. Image by S. Porter. The structure below was made by researchers seeking to understand how bacteria like E. coli detoxify substances like arsenic (2). Many bacteria have systems to protect themselves from heavy metals like arsenic. In E.coli, genes for arsenic resistance are turned on when arsenic enters the bacterium and binds to the ArsR protein. ArsR is a repressor protein that binds to DNA when arsenic isn't around. When arsenic appears, ArsR binds to the arsenic and releases the DNA. Genes in the DNA are transcribed, leading to the production of proteins that pump arsenic of the cell and an enzyme is produced, arsenate reductase, that reduces arsenate to arsenite. 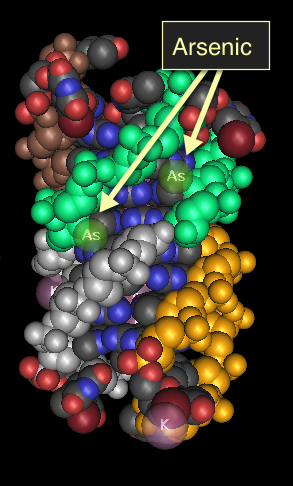 Figure 2 shows a synthetic protein that was designed to bind arsenic in a manner that would be similar to arsenic-binding proteins in E. coli. 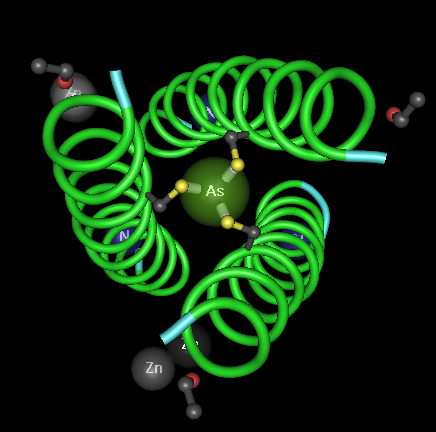 The arsenic is bound to three cysteines in the center of the three coils. I admit this structure doesn't really address the debate. I just liked the image. Figure 2. 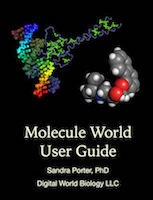 Arsenic and synthetic peptides. Image by S. Porter. The next structure (Fig.3) shows a case where arsenate is replacing the third phosphate in a synthetic analogue of ATP (3). The molecule in this structure isn't a naturally occurring compound; it was synthesized in a lab, but the existence of this kind of analogue does show us that it is possible for an arsenate to substitute for a phosphate, at least in this one case. Figure 3. Arsenic and ATP. Image by S. Porter. The last image is from a DNA quadruplex structure (4). 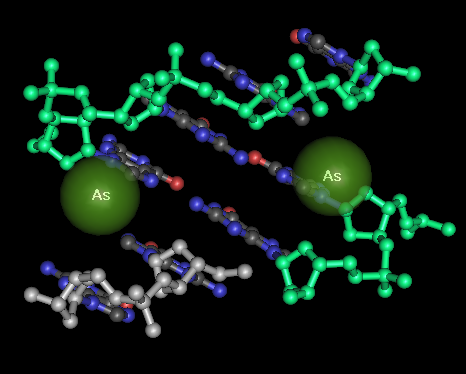 This image shows two arsenic molecules bound to DNA. This image demonstrates that arsenic can stick to DNA and supports RR's suggestion that washing the DNA pellets in the NASA experiment might have washed off any bound arsenic. Figure 4. Arsenic and DNA. Image by S. Porter. Arsenic can replace a phosphate in an analogue of ATP. However, arsenic can also bind in a non-covalent manner to DNA. This means we need more experiments to really know the answer and they need to rule out the possibility of the arsenic just being stuck.